The aim of the study tour was to update knowledge, skills and experience on modern blood donation safety and quality measures, with participants adopting an “observe - listen - ask- discuss - learn” outlook throughout the week. “The ability to observe best practice first-hand has been an invaluable experience,” commented Dr. Musaev, Director of the Jalal Abad Blood Centre. “The study tour has been a unique opportunity for us to be acquainted with German blood bank know-how and we will go on to apply the skills and competencies learnt throughout the week,” added Dr. Ayganysh Satybaldieva, Deputy Director of the Republican Blood Center in Bishkek. The study tour delivered well-balanced information on contemporary challenges of blood donation (donor recruitment and retention methods, blood products processing, storage, transportation, etc. ), infectious and viral safety, preparation of regulatory and certification documents and ethical rules. Staff at the DRK- Blutspendedienst Baden-Wurtemberg; Hessen Institute of Transfusion Medicine and Immunohaematology in Frankfurt; Paul Erlich Institute (PEI) in Langen; Plasmapheresis Center of GRC BTS Nord-Ost; and Charite BTS in Berlin presented their work activities, research projects and strategies to safeguard development in the field of blood donation and transfusion medicine. These topics were of key interest to Kyrgyz participants as the country is moving towards blood services reformation and implementation of new equipment, technical standards and regulations in the field of blood donation and clinical use. “All information and observations from the study tour will be documented and submitted to the Ministry of Health to support further developments in our country,” said Dr. K. Kalmamatov from the Ministry of Health, Bishkek. The study tour program enabled participants to: gain insights on blood donation and plasmapheresis algorithms in various German Red Cross blood centers visited; understand processes and procedures that are purely based on standard operations; receive first-hand information about on-site staff training and to observe how processes are being organized. Participants were able to observe ways in which blood centers recruit, retain, motivate and care for donors by applying various approaches and through the use of visual support materials. Mobile blood donor teams were another area of interest and the group attended a blood donation event in Potsdam where more than hundred people participated. This was unprecedented for them as voluntary blood donation is not very common in Kyrgysztan. 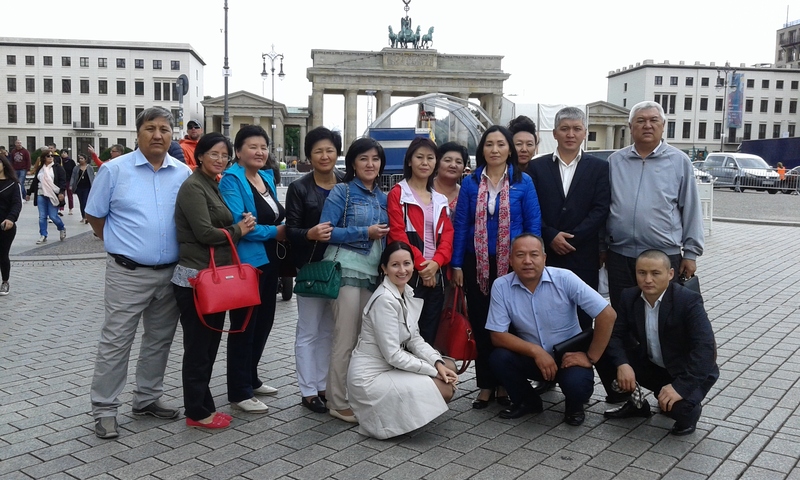 Participants also visited with officials at the Kyrgyz embassy in Berlin and took part in a cultural program in the city.